It seems right to have a narrative attached to this photo. 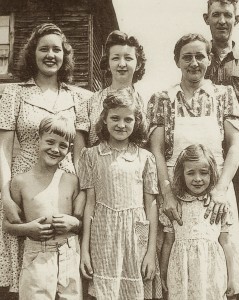 My mom, Betty is the young girl in front, next to her is Joe her brother. You can see by his smile, he has a great sense of humor. The youngest one is Gracie. Aunt Connie is above my mom and Aunt Kitty is above Joe. They are my most favored aunts. I am guessing this photo might be the early 1940’s. My mom thinks she was a tall 7 year old. My Uncle Max, the oldest and Rich, not pictured, were in the military and they both fought in WWII. My Aunt Ruth and Aunt Sue were not in the picture, perhaps they were working in town. I still have a book and a purse my grand daddy gave me. I remember how kind he was.